At the top right corner of your Design screen, there is a Reports button. All the reports are generated as emails (* myBanquet 2.0 offers the option to view/print the reports as PDF). The Application can generate 10 reports. This report lists all the invitees regardless of their confirmation status. The list is sorted alphabetically. This report makes it easier for guests to locate their tables. This report gives the planner a better view on who is sitting where. This report shows all the guests who do not have a seat assigned yet. This report shows all the guests who have not confirmed yet. Similar to the above list, but these guys are the ones getting dessert. This option generates a screenshot of the layout. It is nice to have a print out and be able to work on the details. 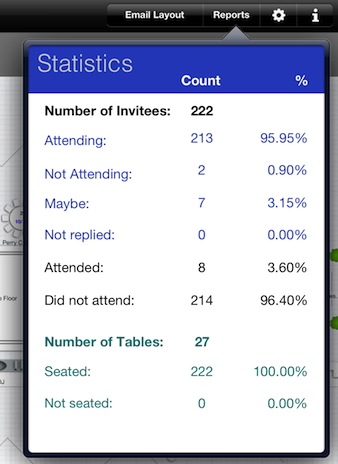 This option shows a brief summary of number of invitees, tables, confirmations, etc.